Made from cold cast resin and hand painted, this Large Raven Statue measures approximately 14.5 inches in length. An unusually intelligent bird, ravens are ever-present in mythology, from Norse tales to the New Testament. 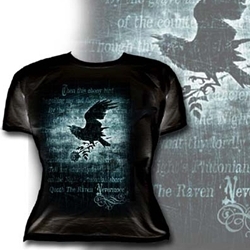 Poe's timeless and tragic poem, The Raven, is epitomized in this dark homage. The Nevermore Earring lets the raven take flight while bearing a cross, ensuring that it adds something truly dark and delightful to your own look. Made from cold cast resin and hand painted, this Mourning Raven Statue measures approximately 7.5 inches in height. An unusually intelligent bird, ravens are ever-present in mythology, from Norse tales to the New Testament.